It's Only A Theory: Evolutionary Psychology or Open Racism? Evolutionary Psychology or Open Racism? Those of you outside of the UK might not have followed this story. Satoshi Kanazawa, an "evolutionary psychologist" and Reader in Management at LSE, has posted a post titled 'Why Are Black Women Less Physically Attractive Than Other Women' on his Psychology Today blog (which, alarmingly, is titled 'The Scientific Fundamentalist'). The post has since been taken down but above is a screenshot of it. I am writing to express my outrage about Dr Kanazawa's post on his Psychology Today blog. As a former Master's and doctoral student of LSE and as a philosopher of science, I am very disappointed that my Alma Mater's name is associated with research that seems to be as unsound in its methods as it is inflammatory and divisive in its content. As an academic, I fully understand the importance of and strongly support academic freedom, but I do not think that academics should be allowed to express openly racist ideas under that guise, especially if this is done while claiming a pretense of scientificity. 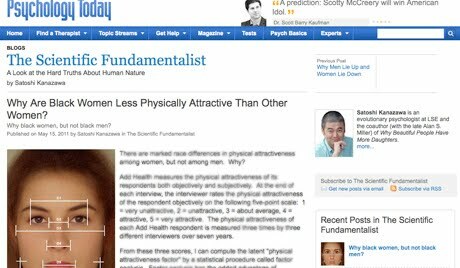 Of course, as researchers, we should always follow our research wherever it leads us, but the problem with Dr Kanazawa's research is that it is not its conclusion that is racist but its premises (as you probably know, the title of Dr Kanazawa's post was "Why Are Black Women Less Physically Attractive Than Other Women? ", which assumes the racist stereotype that they are). The LSE's reputation has already been tarnished enough by recent events that led to the resignation of your predecessor. I hope you will prevent it from being tarnished even more by this incident and issue a statement to distance the school from the ideas expressed by Dr Kanazawa and an apology to all people (and especially to black female students, faculty and staff) who felt offended and outraged by the open racism professed by one of your academics. PS I thought I'd let you know that I shall post this letter on the philosophy of science blog that I administer and contribute to. I'd be happy to also post a link to an apology statement from LSE when and if you decide to issue one. I hope you'll join me in expressing your outrage at open racism being passed as science by e-mailing Professor Rees's PA at v.mizgailo@lse.ac.uk. (You'll receive a silly stock e-mail in return). "The University of London [Student] Union Senate, the union's legislative body, which represents more than 120,000 students, to vote unanimously for the dismissal of Kanazawa, and to condemn his research." You can read the full article here. "The LSE launched an internal investigation into Kanazawa's comments after senior academics at the school, including the new director, Judith Rees, received letters of complaint over the remarks." Should Anonymous Comments Be Allowed? General Philosophy of Science: What is it Now?